We have two (companion) bills on highly capable programs before the Legislature. 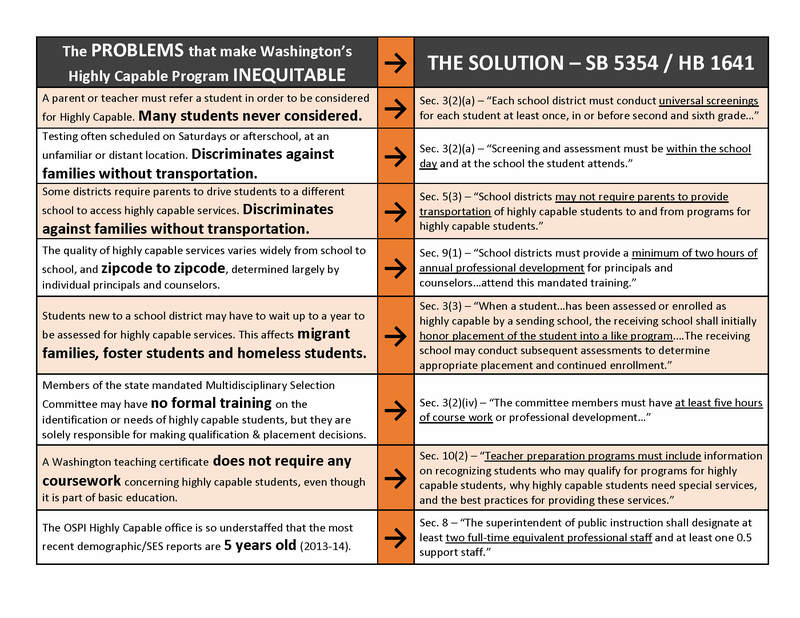 SB 5354 and HB 1641: Concerning Programs for Highly Capable Students. You can read the bill in its entirety here. Getting a bill introduced is only the first step. Bills must get a public hearing in the policy committee(s) before the cut off date. Sometimes this is difficult to do. Over 1100 bills have already been filed this session with more to come and there will not be time to hear them all. We want to be sure our bills get an early hearing in both the House Education Committee (HB 1641) and the Senate Early Learning and K-12 Education Committee (SB 5354). We ask your help in getting a hearing scheduled. Below is a list of the members of the House and Senate education committees. If any legislator listed for either committee is yours, PLEASE email or use the hotline 1.800.562.6000 and request that they ask the committee chair to schedule an early hearing date. Be sure to give the appropriate bill number. Please take this first step within the next 72 hours. Sooner is better than later. There will be subsequent opportunities to advocate for these bills including one we’ll be sending out next week, but this is the first and most important. Without a hearing, the bills are dead and we’ll have to start all over again next year. Thank you for taking this important step for our highly capable students!